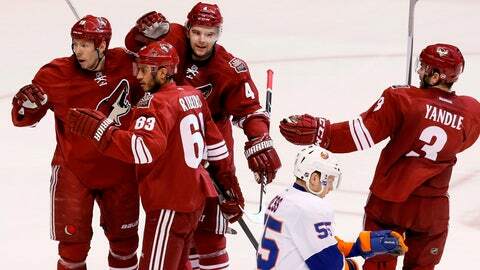 Phoenix's Mike Ribeiro (63) celebrates his goal with teammates David Moss (18), Zbynek Michalek (4) and Keith Yandle (3) as New York Islanders' Aaron Ness skates past Thursday night in Glendale, Ariz.
"You see a lot of the Eastern teams come out and they go through California and it seems like they lose games there," Coyotes coach Dave Tippett said. "We look at it as if we lose games to (Eastern teams), we’re losing ground on people." "It’s hard to put your finger on it," said Tippett, who admitted he’s never seen one conference dominate another like this. "You go on the road, it’s a different game," said center Mike Ribeiro, who had a goal and two assists in Thursday’s win. "You can’t take anything for granted. It’s a big road trip for us — four big games." "It’s been a while," Boedker said. "Its nice to put it in and hear you own crowd cheering for you."